A unique way to make your kit more portable when less bags to carry is ideal. Each shell fits inside of the next larger drum to utilize space, as the kick drum is carried within a padded case. The kick and floor tom both are split shells with an installed maple reinforcement ring to add shell integrity and prevent any loss of sound. Custom draw latches that are specially drilled to prevent shell turning or rotating. Various thickness foam pieces are inserted when nesting (or soft padded bags depending on sizes) for safe and protected travels when hauling to the next gig. 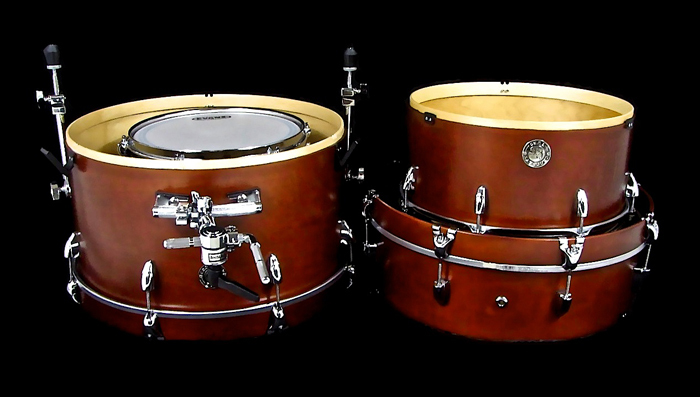 Finished in Burnt Sienna Satin Stain over Standard Series Maple shells. 9×12″ rack tom, 14×16″ floor tom, 16×20″ kick drum with a vintage rail tom mount that is easily removed and packed away. Other hardware includes tail light lugs, 2.3mm triple flanged hoops, DSS tom suspension mount, rounded butterfly claws, and pro spurs. 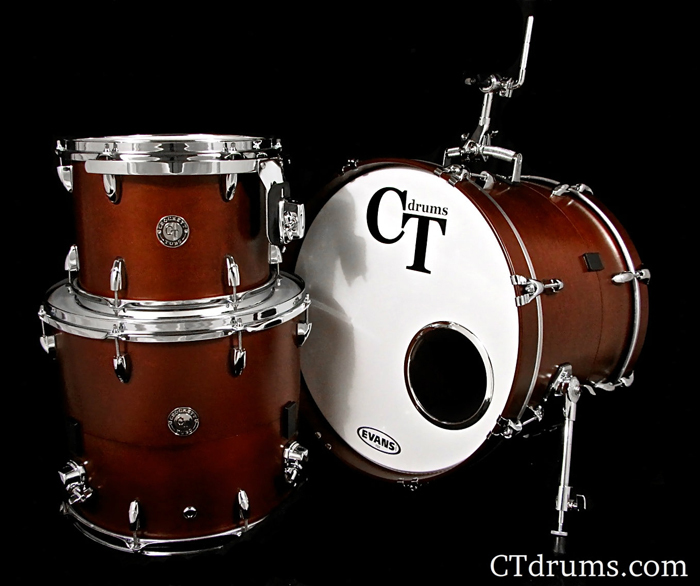 Posted on July 22, 2012, in Kits, Standard Series, Unique Builds and tagged 14x16", 16x20", 9x12", burnt sienna, crockett tubs, ct drums, custom drums, drum, kit, nesting, satin stain, standard series, tail light lugs, triple flanged hoops. Bookmark the permalink. Leave a comment.